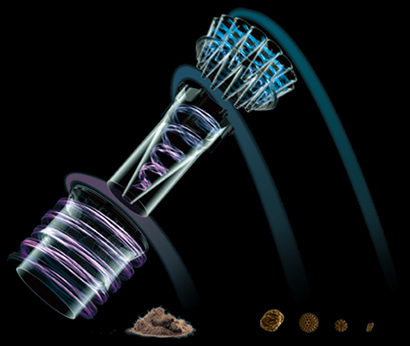 When you hear the name “Dyson”, you automatically imagine sleek, futuristic, intelligent appliances. This is no exception. But does the performance match the looks? I don’t think I need to go further into the Brand’s history, as we all know Dyson is well-known for quality and innovation! 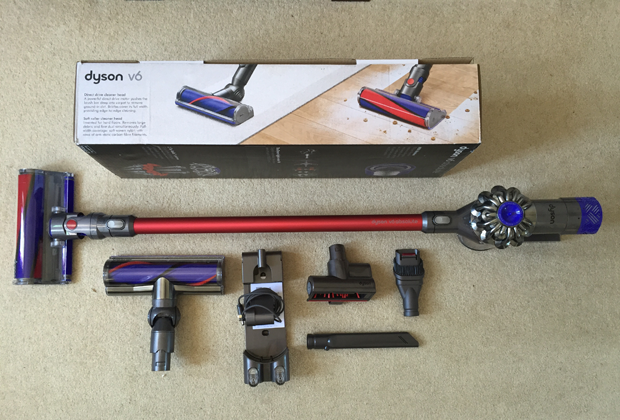 Here we will take a look at the Dyson V6 Animal Cord Free Vacuum. This vacuum is It’s on the higher side of the pricing scale. The V6 is the updated version of the DC59, the only difference being the added tools supplied with the V6. 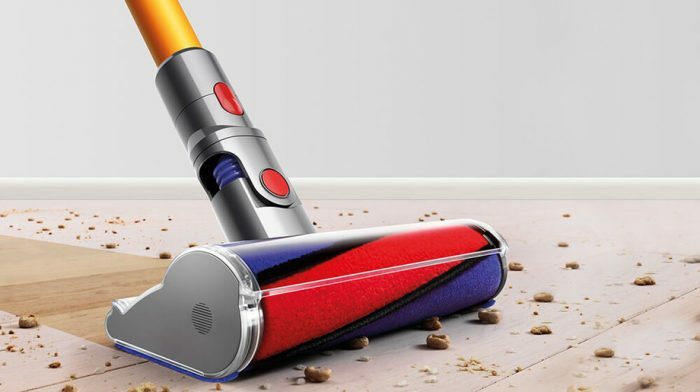 Just as you’d expect from Dyson, the V6 Cord Free Vacuum is sleek, sophisticated, and stylish. There is really not a lot to it, in terms of bulk and size. 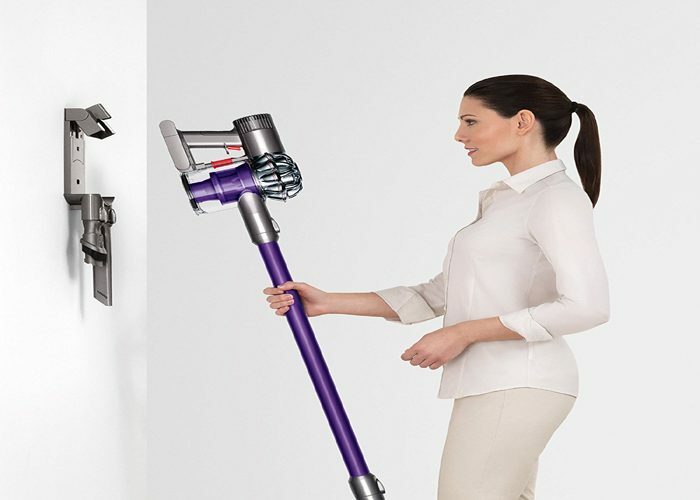 The model features a slender wand, compact handle and dust-cup at the top, and a transparent cleaning head at the bottom. All in royal purple and grey/silver, I wouldn’t mind having this on display in my house! You can tell just by looking at it that it is well-made and sturdy. One thing that stands out when reading reviews of the V6 is the cleaning power, especially when the “Max boost” button is used. This button gives the machine an extra kick of extreme suction to get deep into long, shaggy carpets where dirt and debris can be difficult to remove. This will use up a lot of the battery, but it’s so worth it when you happen to spill a whole lot of something all over your rug! What’s more, pet-hair is doomed; the Max Boost mode can deal to even the most stubborn deposits of fur in the most inconvenient places. The technology used in the V6 includes the “Direct-Drive” cleaner head. 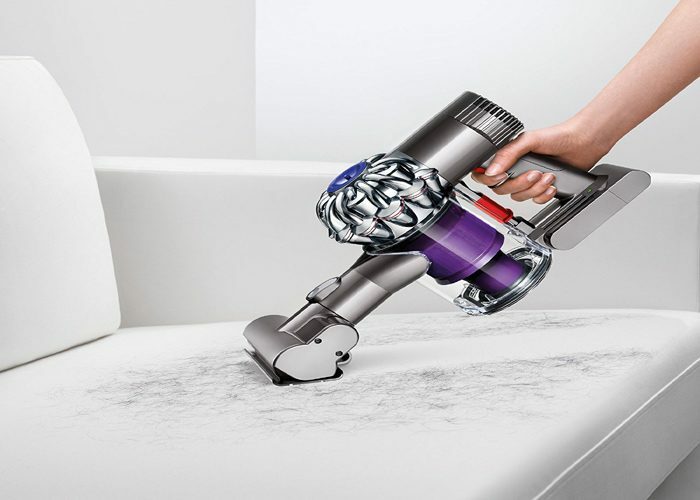 Basically, this means that the bristles are driven deeper into carpet fibers in order to dislodge hiding debris.According to Dyson, the V6 motor spins up to 110,000 times per minute. You can imagine how much suction this can create, even on the standard power setting. When pet hair is involved, it’s a good sign when a vacuum has some powerful technology behind it! Otherwise, it’s just not worth the spend. Impressive suction and direct-drive technology are not the only aspects that makes the V6 a wonderful cleaner. The cleaning head has “brushroll” design, with multiple rows of bristles. These bristles are great for hard floors, as they “grab” the particles that might not have been caught by suction alone. We will get into this next, but the design of the machine itself really boosts the cleaning opportunities with the V6. First off, this machine is light! At less than 5 pounds, you can zip around the house, run upstairs, getunder beds, and everywhere in between, without needing a massage afterwards. When you are cleaning surfaces above your head, you certainly don’t want a big, heavy machine wobbling precariously above you. The balanced and even weight-distribution of the V6 allows you to have full control when cleaning high-up areas. Obviously, the cordless nature makes this model instantly more transport-friendly than other vacuums. Not having to switch power outlets or trip over cords really does make a difference, I find. Also, the machine is powered by holding down a trigger, rather than an on/off switch. I like this because it gives you full control over how much battery you are using; just hold the trigger down to clean, and release it when you need to relocate or reposition. The variety of wand-length (or lack of wand if you like!) is a huge plus with the V6. 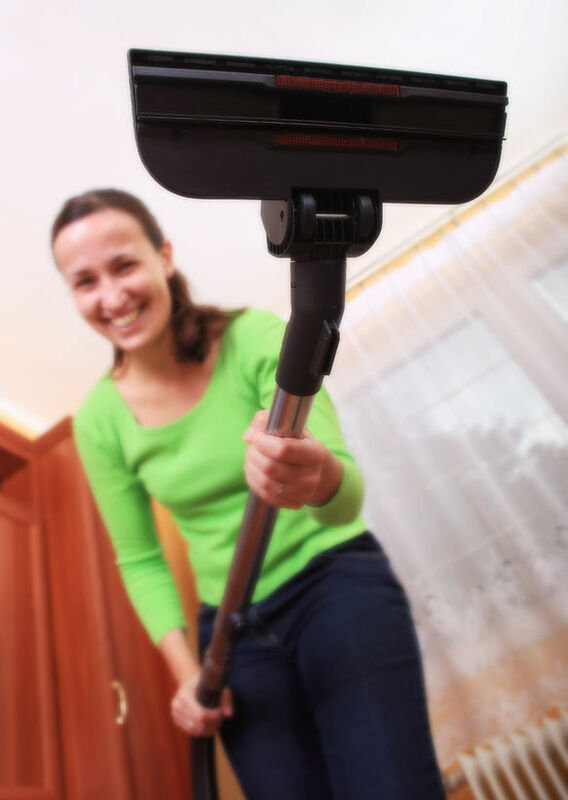 You can remove the wand and use the machine as a hand-held vacuum for getting in close to areas such as cars, cabinets, windowsills, and down the back and sides of sofas. On the other end of the scale, you can extend the wand to the maximum length and reach up into corners to get those annoying cobwebs and dead bugs! You don’t need to worry about any issues when storing the V6; the docking station can be mounted onto the wall in any room you choose, so the vacuum can be clicked into placed when it’s not being used. No need to take up room in your closets or cupboards, the V6 can sit inconspicuously on the laundry wall. 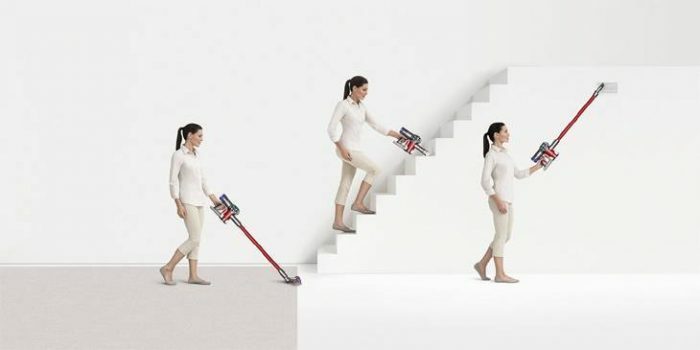 It would be very unlike Dyson to create a vacuum that wasn’t highly-maneuverable. The V6 is very easy to push and pull around all corners and crannies as the ball-shaped steering feature moves with you as you clean. There’s no getting around it…the dust-cup is small. At 0.105gallons, you won’t be able to do a full house-clean with this one unfortunately. Although, in saying that, I don’t think you would want to choose this as your full-house, heavy-duty carpet cleaner anyway. I think it would be best for spot-cleaning, a one-room job, a quick ceiling/corner clean, or for sudden spills and messes. I can imagine this being an additional machine for those with large homes who don’t want to haul the primary vacuum out of the closet just for a quick tidy up or one-off spill. Whatever types of floors you have in your home, the V6 can handle the job. The Direct-Drive cleaner, super suction, and bristle-layers makes for spotless carpets and hard floors. Pet hair and dander which can lie as a hovering layer over your hard floors will be sucked up easily, and if not…the bristles will be sure to catch it all. The same goes for your carpets; embedded hair really doesn’t have a chance against the innovative technology used. – Mini motorized tool: this is the dedicated pet-hair tool. It is handheld and very tough, so you can really get to work on your furniture to remove all traces of your dog or cat’s fur and dander. 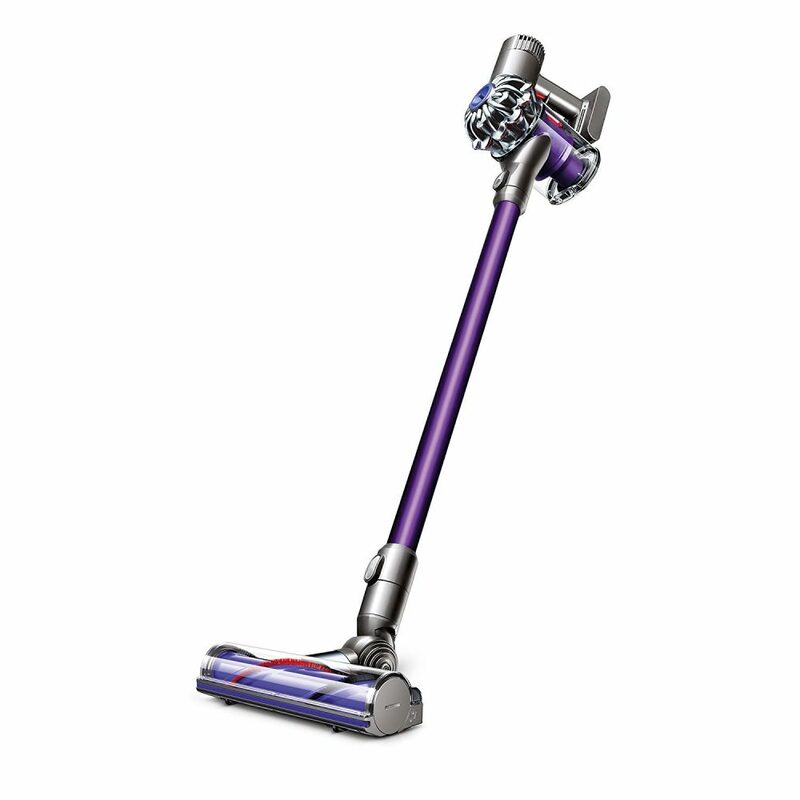 Dyson doesn’t scrimp on filtration; the V6 has a certified asthma and allergy-friendly filter. 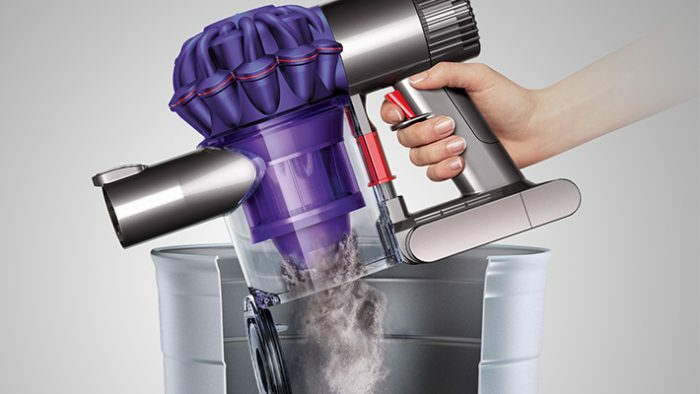 While the filter isn’t a HEPA filter per se, it has been designed and innovated by Dyson to be as health-conscious, safe and effective for those with asthma. The filter system in the V6 Animal model has been formulated with pet-heavy households in mind. There is so much about this model that makes it a worthy purchase, and yet, there are some things to consider. If you are looking for one vacuum cleaner to take care of all your house-cleaning duties, it might be best to opt for a plug-in canister vacuum for the sake of a larger dust-cup and limitless cleaning time. This is especially valid if your home is medium to large. However, if you already have a vacuum that you use for full-floor cleaning, but find you also want to do some smaller, more “fiddly” cleaning jobs throughout the week, something like the V6 could be a great investment. The light weight, maneuverability, pet-hair cleaning abilities, and versatility allows you to do all your dusting, upholstery cleaning, and pet-hair removal with one machine. It’s so easy to store and use, you could reach for it daily in order to keep the fuzzy layers on your furniture and floors at bay. 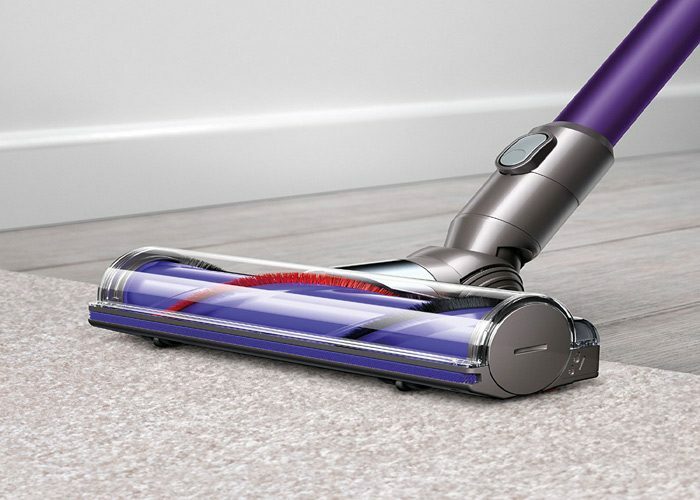 On the other hand, if you live in a small apartment,the V6 could be great for your full-home floor cleaning and small jobs, even if you need to make a couple of trips to empty out the dust-cup. The power of a Dyson with the convenience of a stick makes this one of the best cordless vacuums any pet owner can buy want for. If you’d like longer than 20 mins cleaning time you could look at the V7 Animal, for 30 mins cleaning; or the V8 Animal, for a full 40 minutes of cleaning time!